Live in the now, they say.Aim for the future… let go of the past… People are always trying to tell us that those yesteryear ages are gone and are somehow holding us back from becoming who we might potentially be. The thing is… following that advice doesn’t seem to be making a clear and positive change in the present world, either! How are we to know that all this “present-living” is really having any impact at all if nothing seems to be changing!? But, there is something even more important to consider: what happens when something in the past went wrong? We’re on a mission folks, and a number of you have been very active in our forces to help bring about the necessary change to help restore the timeline and fix what has gone very, very wrong. We’re at crucial levels of chronomatic displacement and almost all our worlds recent tragedies can be tied to a single dreadful event. If we are able to restore the timescape to what it was intended, everything could be restored. We might live in the utopia we were supposed to have… one of peace, love, and the grooviest of music. And that is why we aim to fix what broke… and revive Disco! We’ve got all the gear we need to make this mission a success, but we need some jiving bods to make it happen. 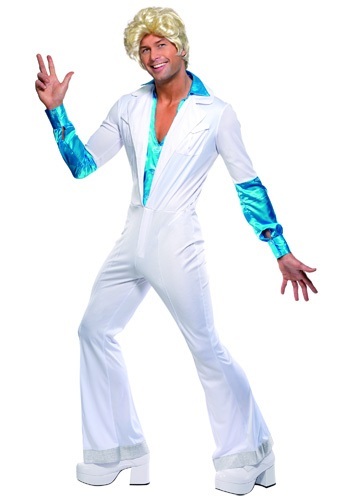 Join us and help the restorative efforts with this ‘70s Disco Man costume. The polyester white jumpsuit has an attached blue undershirt and the deepest V-neck that we could manage without upending the cosmos. Bell bottom pant legs have a shining metallic cuff and will go perfectly with any platform shoes that you can manage. Don a wig or wear some extra chains for greater authenticity. We’re depending on you. Bring your dancing queens, disco studs, and peace and love powers to bear, because this year, we’re reviving Disco to crazy living color.